I WAS NOT PREPARED TO FEEL SO SAD DAMMIT. Wait, so Lee's Mom knows about them? I didn't realize they were more than "friends." Well, except for the banner art. Well, they aren't "more than friends" in a romantic sense, but they've been best friends since they were little. It's probably uncouth to explain my own comic, but Lee's mom is just in tune with the fact that they're close and that it's surprising that they haven't talked about what they're doing after high school. I see. My inner AP English high school student had to overanalyze the tonal shift from the "We" to "He" as indication that Mom knew more than she let on, or maybe that's just my Mom? I can't wait for what's next! 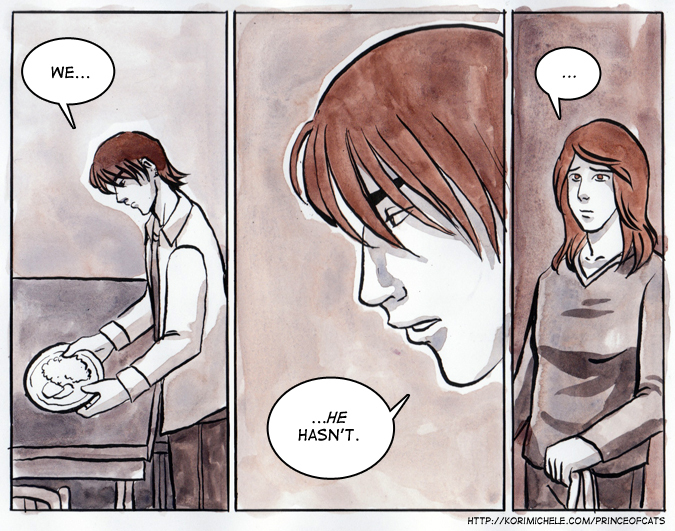 No other LGBT-themed webcomic has left me this intrigued since Megan Rose Gedris' "Yu + ME." Ah, good old AP English.